One of the most valuable gifts you can give parents is personal comments. See how to leave better comments in less time with these 9 tips! Bribes or Incentives? How to Tell the Difference. Sometimes student incentive programs look a lot like bribery, like the proverbial carrot on the stick. Here's how to tell them apart. The right behavior rubric can transform the environment of your whole school. Make sure you’re using the best method to develop it! Getting feedback regarding behavior expectations can be overwhelming. Here are the best ways to make sure everyone is heard at equal volume. Meet School Success Representative, Hannah! If you're interested in LiveSchool, you've probably talked to our School Success Representative, Hannah. Our LiveSchool leader for April is Cherri Byford, a School Counselor in Fort Smith, Arkansas! LiveSchool Leader Spotlight: Louise Lewis of Washington, D.C.
Meet our March LiveSchool Leader, Louise Lewis! Ms. Lewis is the Assistant Principal of Kelly Miller Middle School in Washington, D.C. Learn how LiveSchool's Random Student Selector feature brings fairness and fun into the classrom. House Points: Let the Games Begin! LiveSchool's new House Points app makes it easy to build school spirit and friendly competition! Learn the story behind LiveSchool's IES research grant and the new LiveSchool Insights system. We headed from to Tulsa, Oklahoma to see the innovative things our customers are doing with LiveSchool. Announcing Single Sign-On with Clever! SSO means teachers can log on with a single click from your Clever dashboard! Learn how to upload behavior data to Illuminate to access advanced reporting features. Use these free and affordable ideas to motivate any age student to work hard for behavior points. 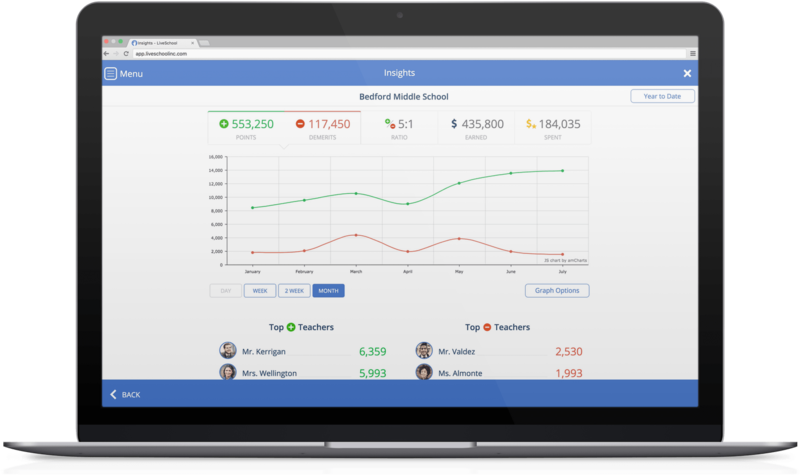 It's a secure, web-based platform to track, reward and improve behavior in your school.